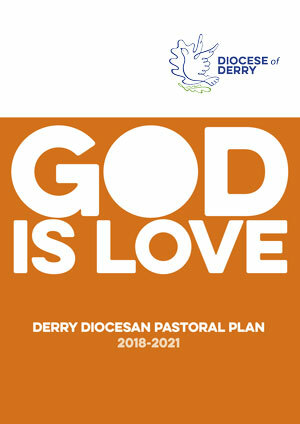 ‘God is Love’ – the Derry Diocesan Plan 2018–2021 sets out the path that we as a diocese hope to take in every parish community over the course of the next three years. 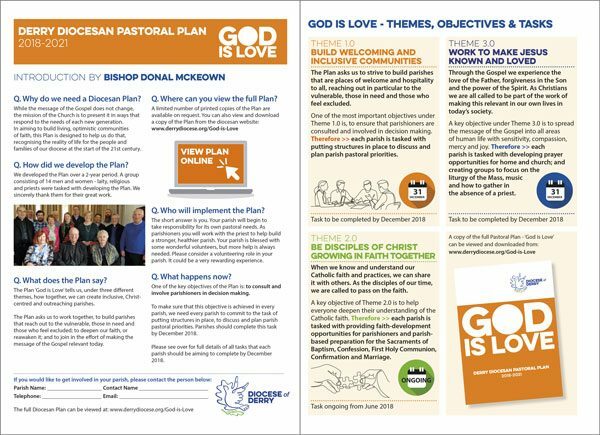 These resources have been produced to assist parishes with the support they need to achieve their potential. These are regularly updated and added to. The slide presentation below was given at the Pastoral Plan Youth Workshop on Saturday, 29 September 2018 in Thornhill College, Derry. The slide presentation below on ‘Reaching out to those who feel Excluded’ was given at the Pastoral Plan Youth Workshop on Saturday, 29 September 2018 in Thornhill College, Derry. The documents below illustrate what was produced by the Parish of Bellaghy to conduct their parish survey. This is a useful example of a parish survey carried out in the Parish of Bellaghy. The instructions Bellaghy Parish gave to the volunteers distributing the parish survey. This is a useful example of the results and analysis of the parish survey. This is an example of the results of the survey fed back to parishioners. The documents below illustrate what was produced by the Parish of St Eugene’s Cathedral to conduct their parish survey. This is a useful example of a parish survey carried out in Eugene’s Cathedral Parish, Derry. 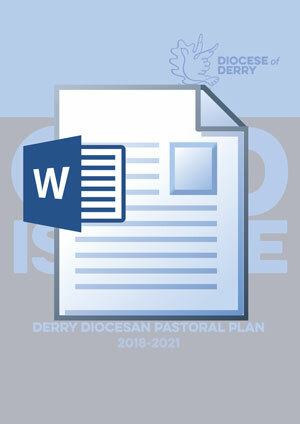 The documents below illustrate the Youth Ministry programmes currently running in the Diocese of Derry. This Powerpoint presentation was given at the Pastoral Plan Youth Workshop on Saturday, 29 September 2018 in Thornhill College, Derry.